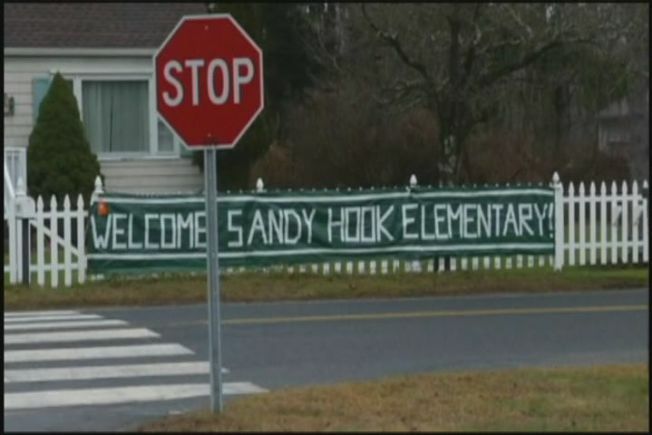 Sandy Hook Students Head to "Safest School in America"
Classes resumed on Thursday for the students of Sandy Hook Elementary School for the first time since last month's massacre in Newtown, where a gunman killed 20 first-graders and six educators. With their original school still being treated as a crime scene, the more than 400 students are attending classes at a refurbished school in the neighboring town of Monroe. Attendance on Thursday was good, officials said. There were no issues at school and students were excited to see their friends and get back to school. To help ease the return, therapy dogs were brought in and several students spent a little time with them, White said. Counselors were also available. Gov. Dannel Malloy called the effort to return to school "Herculean." "It is the stuff that Connecticut is made of," Malloy said. Law enforcement officers have been guarding the new school, and by the reckoning of police, it is "the safest school in America." The school district said parents who want to be close to their children were welcome to visit and stay in classrooms or an auditorium throughout the day and some parents took the opportunity. The lecture hall was full and parents had the opportunity to meet with school board members, White said. Parents were encouraged to have their children take the bus to help them return to familiar routines. Still, Newtown Superintendent Janet Robinson said officials will do their best to make the students feel at ease. "We will go to our regular schedule," she said. "We will be doing a normal day." Returning students, teachers and administrators were met by a large police presence on a sunny and cold day with temperatures hovering near 10 degrees. Several police officers were guarding the entrance to the school, and were checking IDs of parents dropping off children. When police were asked how long a large police presence would remain at the school, White said the decision would be evaluated on a week to week basis. “We’re going to focus on the school. Again, the students’ safety is of utmost importance to both towns,” White said. “We don’t want them to think this is a police state. We want them to know that this is a school, and a school first, and that’s a place where some to learn, enjoy their friends and grow up,” White said in response to another question. On Wednesday, the students and their families were welcomed at an open house at their new school, which was formerly the Chalk Hill Middle School in Monroe but renamed as the Sandy Hook Elementary School. The new building was decorated like a winter wonderland, filled with snowflakes people from around the world sent to the Connecticut PTSA to help make the students feel welcome. Students received gift boxes with toys inside and shared joyful reunions with teachers. "Right now, Chalk Hill has been transformed from a middle school to a very cheerful, nurturing elementary school," Robinson said. Former principal Donna Page is leading the school, and Robinson called this a "godsend" to help the transition process. One father, Vinny Alvarez, took a moment to thank his third-grade daughter's teacher, Courtney Martin, who protected the class from a rampaging gunman by locking her classroom door and keeping the children in a corner. "Everybody there thanked her in their own way," he said. The gunman, Adam Lanza, also killed his mother at the home they shared in Newtown before driving to the school and gunning down 26 people, including the school's principal. Lanza fatally shot himself as police arrived. Police haven't released any details about a motive. Numerous police officers on Wednesday guarded the outside of the Monroe school, which is about 7 miles from the old school, and told reporters to stay away. "I think right now it has to be the safest school in America," Lt. White said. Teachers attended staff meetings at the new school on Wednesday morning and were visited by Gov. Dannel P. Malloy before the open house, White said.